This large 38mm. chrome plated DOXA ANTIMAGNETIQUE from the 1940’s really does look great in person. Most of the (usual) wear marks in the chrome are NOT visible on the wrist-it truly looks clean in person…just like steel. The very fine looking dial is perfectly balanced and looks very vintage with the original leaf hands, raised metal Arabic and arrow markers and sweep seconds. 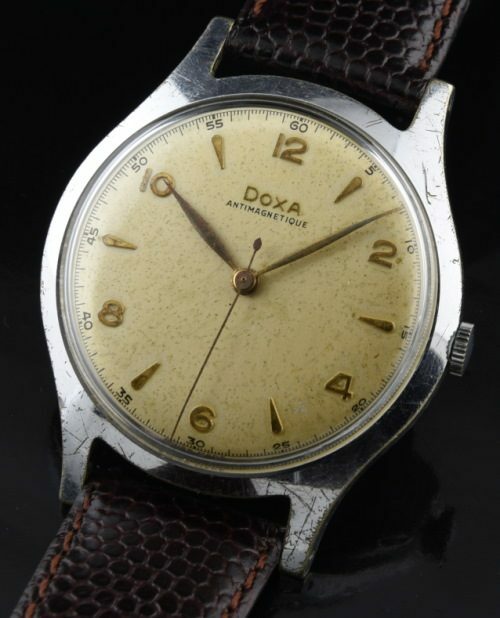 The fine DOXA movement was just cleaned and is accurate. This is a large and very fine looking watch-you are going to love it!